Have you ever seen a fisherman? What was he doing? Was he mending his nets? Or making crab-baskets? Or was he painting his boat? 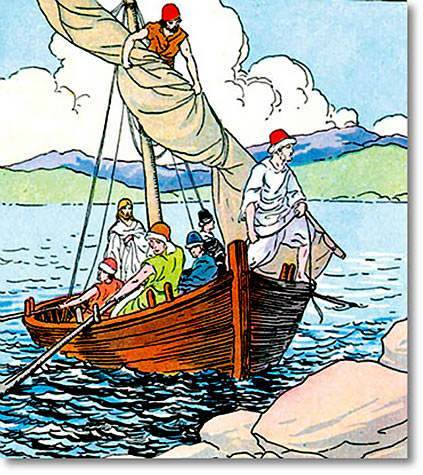 Perhaps you went for a row in his boat on the blue sea? When Jesus grew to be a man He worked in the carpenter’s shop at Nazareth to earn bread and clothing for Mother Mary and for His brothers and sisters. Then when these were big, He laid down His tools and set off on His travels. He wanted to tell everybody about the loving Heavenly Father Who clothes the lilies and feeds the birds. He knew He would need helpers, so He looked about for some men who would make good helpers. First of all He chose four fishermen. This was how it happened. One day He walked by the Sea of Galilee, and He saw two fishermen who were brothers. Peter and Andrew were throwing a net into the sea in hopes of catching fish. Jesus stood still and watched them. Then He said, "Come follow Me, and I will make you to become fishers of men." And at once they left their nets and followed Him. They were glad to be His friends and helpers. 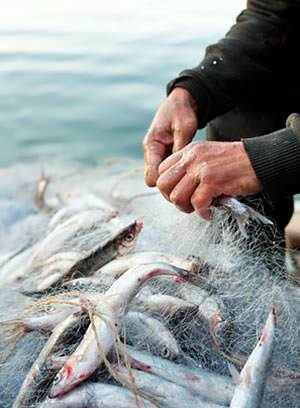 A little further on two other fishermen, James and John, were in a boat mending their nets. James and John were brothers, and sometimes they went out fishing with the other two brothers, Peter and Andrew. 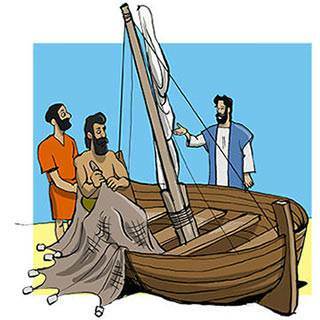 Peter and Andrew went on with Jesus, and were ever so glad when He stopped in front of the boat where James and John sat mending their nets. 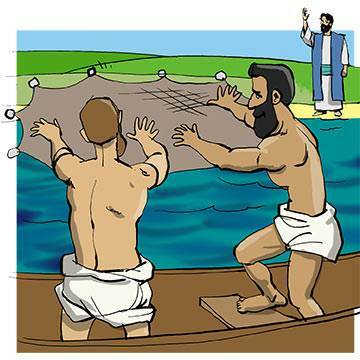 They listened and heard Jesus say to James and John, "Come follow Me and I will make you to become fishers of men." 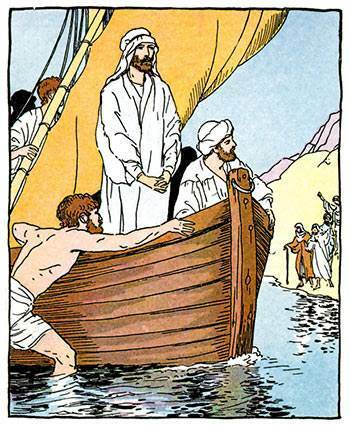 James and John left the boat and their nets and went with Jesus and Peter and Andrew. Not long after, Jesus asked another fisherman, called Philip, to come and be His helper. Philip came, so there were five fishermen who went about with Jesus. We call these helpers who lived with Jesus, His disciples. He chose twelve disciples altogether. He chose them that they might be with Him and learn from Him. 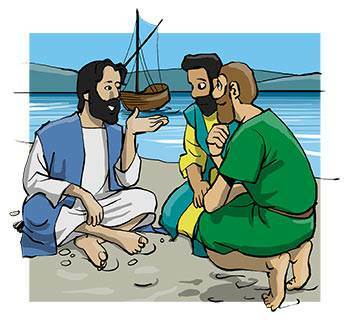 Sometimes Jesus used their boat when teaching the people, who came together on the shore to hear His stories. The fishermen pushed their boat out a little way from shore and Jesus stood up in it and talked to the crowd. 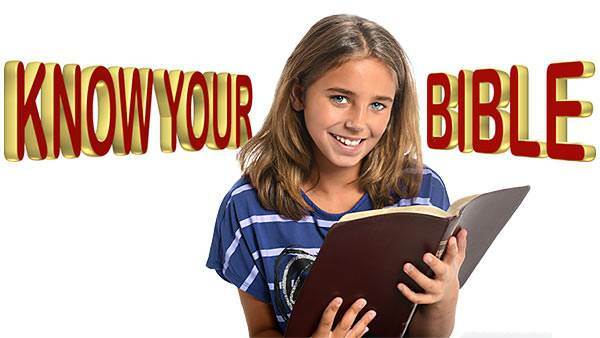 Sometimes the disciples went and taught people about the dear Heavenly Father. Sometimes they cared for the sick, as Jesus taught them. Sometimes they were hungry, and had no house to sleep in. But they were very happy, because they were with Jesus.